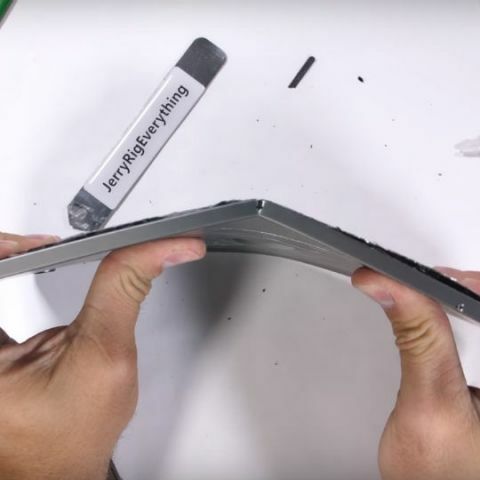 JerryRigEverything has done a bend test on the new 2018 iPad Pro which shows that the tablet is prone to bending quite easily. Apple announced the new 11-inch and 12.9-inch iPad Pro at an event in New York on October 30 and the devices went on sale in India on November 16. If you are looking to pick up the new iPad Pro, be warned – it bends quite easily. A video uploaded by popular YouTuber JerryRigEverything shows how easy it is to bend the new iPads. The video starts out by bending the new Apple Pencil and showing how fragile it is. The view then moves to a slew of torture tests on the new iPad Pro, where the tablet is subject to multiple endurance tests. The YouTuber scratches the display of the iPad Pro with a blade, uses a lighter on the display and draws Spider-Man’s face on the back using a blade. But the highlight of the video is how easily the new iPad Pro bends. It took very little effort and force for the host to bend the tablet right down the middle. The weak points noted were the side where the magnetic charger for the Apple Pencil is placed and the other end (when held in landscape mode) that houses the microphone. The fact that the tablet bends so easily is worrying considering how expensive the device is. With Apple redesigning the iPad from the ground up for this generation, one would think they would put in some thought to the durability of the device. That said, not everyone that will purchase the device will subject it to such pressure. The new iPad Pros are 5.9mm thick and the 11-inch iPad pro weighs 468 grams, whereas the 12.9-inch iPad Pro weighs 631 grams. The new iPads have forgone the home button in favour of Face ID. For connectivity Apple removed the lightning cable in favour of USB-C, giving users the ability to connect the iPad to a host of devices such a 5K display. The new iPad Pros can also be used as power banks to charge other devices. If you are looking to pick up the new iPad Pro, then the price for 11-inch Wi-Fi only model starts at Rs 71,900 whereas the 11-inch Wi-Fi + Cellular starts at Rs 85,900. The 12.9-inch iPad Pro Wi-Fi starts at Rs 89,900 and the Wi-Fi + Cellular version starts at Rs 1,03,900. The second-generation Apple Pencil is priced at Rs 10,900.